This article presents the new denomination that was introduced in 2011 to other smaller ones belonging to the Koala silver series, the Koala 1 kg silver coin 2011. It is the largest size of the series and was also continued in 2012, with a different design as the Perth Mint accustomed investors and numismatists since 2007. The Aussie Koala 1 kg silver coin 2011 weighs 1,000 grams or 32.151 oz. It is quite an amount and it is all represented by pure silver. It therefore has 99.90% fineness. It is also accompanied by other two dimensions: a 100.60 mm diameter and a 14.60 mm thickness. 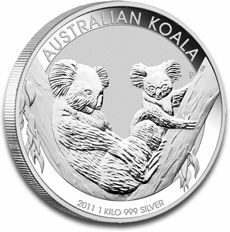 All Koala silver bullion coins issued in 2011, among which is also the Aussie Koala 1kg silver coin 2011, have the same design, the only difference are the inscriptions regarding the weight and denomination. A portrait facing right of Queen Elizabeth II is designed on the obverse of the Koala 1 kg silver coin 2011. The face value of 30 DOLLARS is inscribed at the bottom of the coin and the other two inscriptions are AUSTRALIA and ELIZABETH II. Even though the obverse is a majestic one that is not what really interests the viewer. The reverse of the Aussie Koala 1kg silver coin 2011 is the one that attracts all admiration and intrigue since it illustrates two adorable Koalas gazing down from a tree fork. The name of this fuzzy famous all around the world animal is inscribed at the top of the coin AUSTRALIAN KOALA and the legend also reads 2011 1 KILO 999 SILVER. The value of the Koala 1 kg silver coin 2011 is directly determined by the happenings on the silver market, therefore by the price for silver. Being a much smaller market than the one for gold, there are a number of factors that easily determine how an ounce of silver is priced. For the moment, the silver price is at a convenient level for investment, meaning that it is a proper time for investing into silver bullion like the Koala 1kg silver coin 2011 in order to be profitable in the future. Another clear influence in the way the price for a Koala 1 kg silver coin 2011 moves is demand. Making a comparison between this coin which was minted in 2011 and the coin with the same weight that followed this one you will notice on our website a small difference of price. This is due to the fact that there is a much higher demand for the Koala 1 kg silver coin 2011 than for the silver 1 kg Koala from 2012. And demand is higher because there are not much coins of this kind left on the market. This is one clear example of how investing into silver coins turns into an attractive monetary activity. Demand for the Koala 1 kg silver coin 2011 will increase as time goes by so if you want to trade this bullion coin you will find it on our website.